1926a Heurnia ventromaculata Jong, Zoologische Anzeiger, 67:302-3. 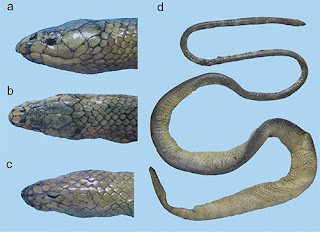 Type locality: Pionierbivak, Mamberano River, North New Guinea. Holotype: ZMA 11066. Collector W. C. van Heurn. The name ventromaculata refers to the ventral spots described by the collector when the specimen was freshly caught. H. ventromaculata is known only from the type locality. The type specimen, a male, has a total length of 702 mm, with a 148 mm tail. The tail/SVL ratio is 26.7%. This snake is known only from the type specimen (ZMA 11066). The head is distinct from the neck and depressed, the body is cylindrical; the eyes are dorsolateral, and slightly larger than expected for a homalopsid. This account is based upon my scale count numbers and they disagree slightly with Gyi’s (1970) counts for several characters. On the head the rostral is pentagonal and broader than tall, it is visible from above. The nasals are divided and are separated by an internasal. The nares are located toward the inner edges of the nasals. The prefrontal is fused with the loreal on the right side. On the left side the prefrontal and loreal are separate. The loreal is twice as long as tall. The prefrontals are tuberculate, while some other scales also have tubercles; the prefrontal tubercles are better developed. The frontal is elongated and about equal in length to the parietals. The parietals are entire. The loreal is in contact with upper labials 2 - 4. The supraocular is elongated and single; the preocular is single and about two times taller than wide; the postoculars number two on each side. The dorsal and ventral scales are about equal in area. There are no subocular scales, although the ventral postocular undercuts the orbit. The temporal formula is 1 + 2 + 3 on both sides, the primary temporal is exceptionally large. The third row is difficult to distinguish from the occipitals. There are enlarged scales following each of the parietals but separated from the temporals by smaller scales. The upper labials 8/9; the largest are 5/6. The fifth one enters the orbit on the right; the fourth one enters the orbit on the left. The eighth upper labial on the right is divided; none are divided on the left. On the chin the lower labials numbers 14, the seventh is the largest and the second is the smallest; 1-3 contact the first chin shield. There are three pairs of enlarged chin shields, the second and third pairs are separated by pairs of smaller scales. The anterior pair of chin shields is only slightly larger than the second pair, and the third pair is shorter that the first two pairs, but broader. Gulars number seven. On the body the dorsal scale rows number 29 on the neck, 27 at mid-body, and 21 at posterior body. The dorsal scales are lanceolate in all rows. The ventral scales number 163 and they are narrow. The anterior ventral scales are less than twice the height of a nearby dorsal, and at mid-body and posterior body the ventrals are a little more than twice the height of a nearby dorsal scale. On the tail the divided subcaudal scales number 56. The scales on the dorsum of the tail are similar to those near the vent. At the base of the tail the width is 84% of the height in the one specimen. Color and pattern. The first 4 dorsal scale rows have light pigment, there is no pattern on the other rows, presumably it was uniform in color, but the specimen also appears faded. The venter is mottled. Jong (1926a) had notes from the collector, W. C. von Heurn, who described the color in life as a uniform gray-black or mud color on the sides and dorsum with a lighter venter with gray-black spots that extend onto the chin and labials. While nothing is known about the details of H. ventromaculata life history, the area that it lives in has been studied by ecologists because of a project to dam the Mamberamo River for a hydroelectric plant to power a large industrial complex. The Mamberamo River is about 650 km in length and drains a region of steep, rainforest covered mountains, with a catchment that it is 76,000 km2. The river carries a heavy sediment load. The Mamberamo River basin has a rich biodiversity; and its estuary has large areas of freshwater swamps and extensive areas of mangrove. Thus, there may be other homalopsids and aquatic herpetofauna to be found in the area (Muchtar and Ilahude, 2001; Richards and Suryadi, 2002).